Lately I’ve been having cravings for fish, but instead of pan-frying a fillet and call it a day, I decided to try something a little bit different and decadent, so I went with a fish stew. 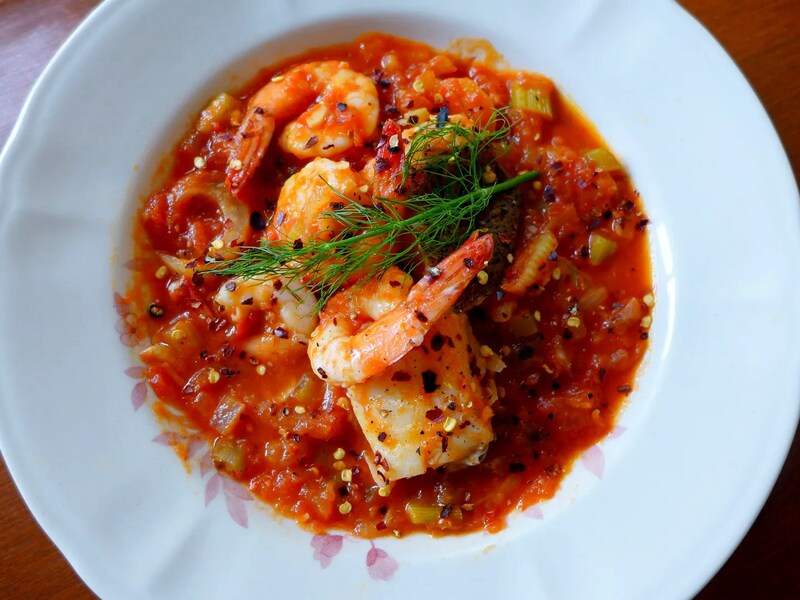 There are many variations of fish stew, but interestingly most involves more than one type of seafood. I don’t know if this one is authentically Mediterranean, but what I do know is that this is delicious because it involves one of my current obsessions: Fennel. Fennel is rarely used in local cuisine, unlike Fennel seeds which are commonly used in curries. It has a unique aroma not unlike that of licorice and anise, and has the texture similar to celery. It’s a very good source of Vitamin C, Folate, Potassium as well as fiber. Preparation wise, Fennel can be eaten raw, lightly sauteed or cooked til tender. It’s a match made in heaven with fish, but I also enjoy it in a salad, like this Massaged Kale Salad I’ve posted a while ago. Red, the colour of happiness. I used 1 large Halibut fillet for this, along with a few medium prawns. You can definitely use more seafood such as clams, mussels or even crabs, or swap the fish for cod or tilapia. 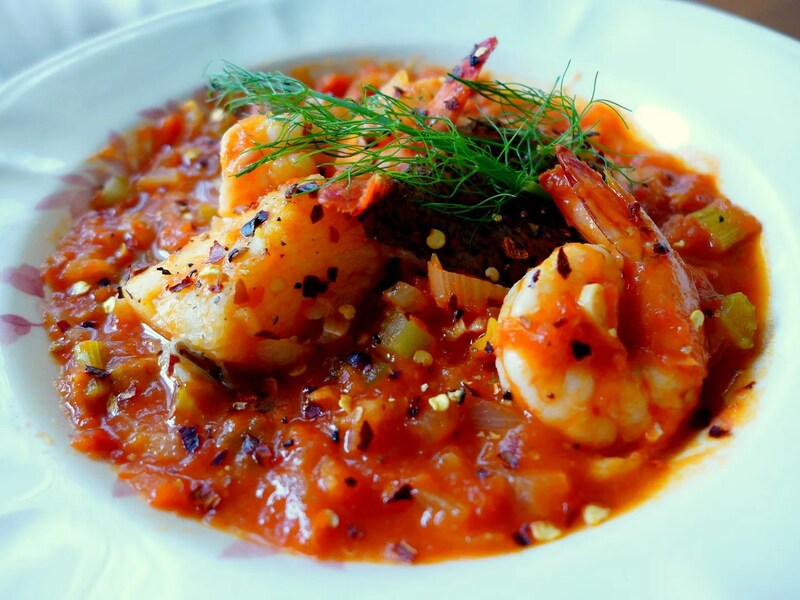 The tomato broth is slowly simmered to bring out the sweetness of the vegetables before the seafood is added. It’s important not to overcook the fish and prawns for the best texture. This dish is often enjoyed with toasts/crostinis, but to keep it Paleo-friendly I’ve gone without. Heat the oil in a wide, deep frying pan. Add the onion, fennel and celery and cook over a gentle heat for 5 mins until softened. Stir through the garlic and cook a couple of mins more. Pour in the wine to deglaze, then add the tomato purée, followed by fish stock, lemon zest. Leave to simmer for 15 minutes, stirring occasionally. Nestle the halibut chunks into the liquid and cook for 5 mins. Add prawns and cook for 5 mins more until the fish is cooked through. Before turning off the heat, squeeze over the lemon juice. Serve immediately, garnish with the frond of fennel and chili flakes. I love the tender flesh of the halibut and the bouncy texture of the prawns. The broth is tangy, spicy, sweet and savoury at the same time with ever slight hint of citrus. Here, the fennel is completely softened which makes it more mellow, and sweet. Needless to say, my craving was satisfied. Steamed rice would be fabulous with this! Fish plus prawns. Sure can’t go wrong with those. bet it tastes great on pasta. Yeah I guess it would be lovely with Pasta too. I just ate it like that.